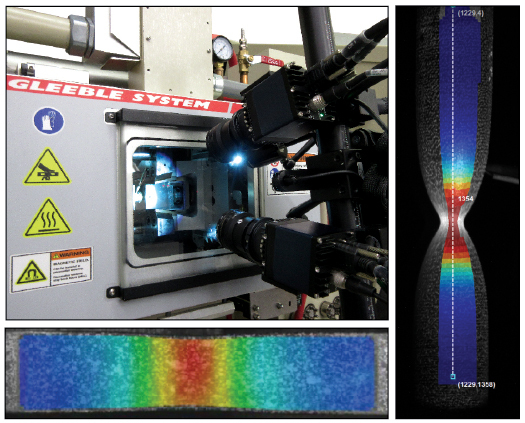 A Gleeble equipped with a LUMet system allows researchers to monitor metallic microstructures in real time, in-situ and at high temperatures while conducting physical simulations. The LUMet system provides unprecedented capabilities by allowing observation of the internal physical state of a specimen during Gleeble tests. Laser-ultrasonics is a technology that enables non-contact ultrasonic measurements, using lasers to generate and detect ultrasound pulses. Unlike other ultrasonic technologies, it can be used on hot materials because there is no physical contact. Therefore, it is ideally suited for in-situ studies of solid metallic materials up to their melting point. The LUMet system generates and detects ultrasound pulses in a sample. To generate the ultrasound pulse in the sample, a high-power, shortpulse laser produces light pulses about 10 nanoseconds in duration. Each pulse causes intense pressure on the surface of the sample and sends an ultrasonic pressure pulse through it. A laser interferometer measures sub-nanometer surface displacement caused by the pulse laser and its subsequent reflections as it echoes through the sample with sub-nanometer resolution. Based on the measured velocity and attenuation of sound in the medium, researchers can determine texture, modulus, grain size and phase mixtures. For those of you that can't make it to New York for a demonstration, please consider attending the 3rd International Workshop on Laser-Ultrasound for Metals on September 21-22, 2017 in Stockholm, Sweden. Digital Image Correlation (DIC) can be used in conjunction with Gleeble Systems for 3D non-contact optical measurements of deformation and strain. DSI has developed a successful combination of high performance cameras, lighting, mounting and licensed software to produce accurate results, even at elevated temperatures (over 1,100˚C). DSI collaborates with the world's leading DIC providers to supply, install and support complete DIC systems. Additionally, DSI can integrate most existing DIC hardware that may have been purchased for other purposes with with new or existing Gleeble Systems. Save the Dates: Get your passports ready! This coming year offers a variety of opportunities for professional development and networking. The nickel-base superalloy, Inconel 718, is widely used in aircraft engines. The control of its final microstructure requires detailed knowledge on recrystallization, grain growth and second phase evolution during thermomechanical processing. The present study focuses on the in-situ evaluation of heterogeneous grain growth in the super-δ-solvus domain (above 1050 °C) using laser ultrasonics. This technology is dedicated to the ultrasonic characterization of microstructure evolution during thermomechanical processing of metals and alloys. The real time measurement of the ultrasonic attenuation provides the evolution of a representative grain size in the material. A criterion is developed to determine the onset and completion of heterogeneous grain growth stages associated with the dissolution of precipitates. The laser ultrasonic methodology is validated with ex-situ metallographic observations and quantitative characterization of the grain size heterogeneity. Using a novel in-situ laser ultrasonic technique, the evolution of longitudinal velocity was used to measure the α − β transformation during cyclic heating and cooling in commercially pure titanium. 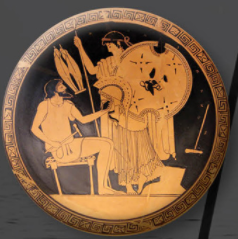 In order to quantify the transformation kinetics, it is shown that changes in texture can not be ignored. This is particularly important in the case of titanium where significant grain growth occurs in the β-phase leading to the ultrasonic wave sampling a decreasing number of grains on each thermal treatment cycle. Electron backscatter diffraction measurements made postmortem in the region where the ultrasonic pulse traveled were used to obtain an estimate of such local texture and grain size changes. An analysis technique for including the anisotropy of wave velocity depending on local texture is presented and shown to give self consistent results for the transformation kinetics. We have refined the contactless laser–ultrasound reverberation technique to measure ultrasonic absorption on small metallic samples. In this technique, a sample is supported by a holder which is ultrasonically decoupled from the sample. A pulsed laser is used to generate an acoustic pulse. After the pulse has mode converted and scattered sufficiently to fully insonify the sample, the decrease in the noise-like ultrasonic signal is recorded as a function of time using a laser-interferometer. A joint time–frequency analysis technique is used to extract an absorption spectrum from the signal. In this paper, the technique is demonstrated in a frequency bandwidth ranging from 1 to 7 21 MHz, and in a dynamic range of 0.003 to 0.3 dB ms . Measurements made on samples of three low-carbon steel grades, namely ultra low carbon (ULC), low carbon (LC), and high strength, low-alloy steels (HSLA), clearly show that ultrasonic absorption varies with steel grade. 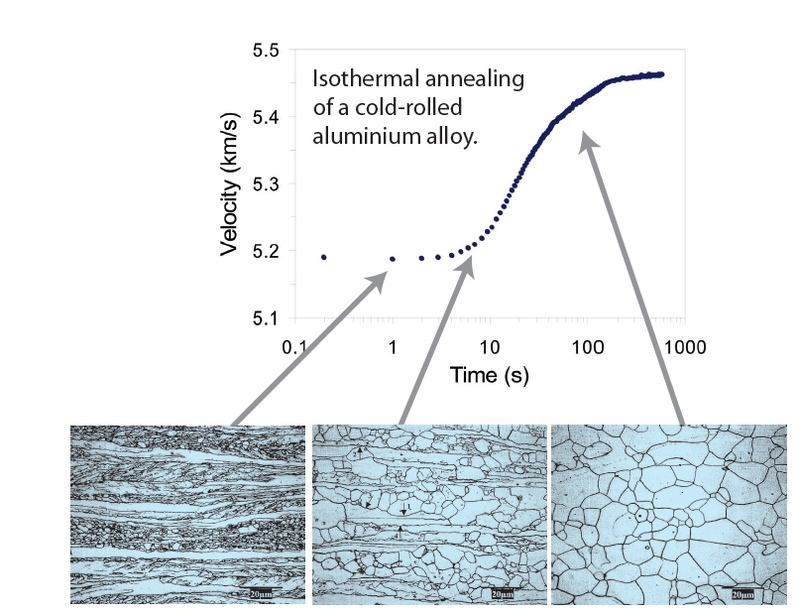 The technique was utilized to study the effect of a magnetic field on the ultrasonic absorption of an annealed ultra low carbon steel sample. It was found that magnetoelastic effects are responsible for a large fraction of the total absorption. Ultrasonic NDE is one of the most promising methods for non-destructive diagnostics of residual stresses. However the relative change of sound velocity, which is directly proportional to applied stress, is extremely small. An initial stress of 100 MPa produces the result of dV/V~10 ^-4. Therefore measurements must be performed with high precision. The required accuracy can be achieved with laser-exited ultrasonic transients. Radiation from a Nd-YAG laser (pulse duration 7 ns, pulse energy 100 lJ) was absorbed by the surface of the sample. The exited ultrasonic transients resembled the form of laser pulses. A specially designed optoacoustic transducer was used both for the excitation and detecting of the ultrasonic pulses. The wide frequency band of the piezodetector made it possible to achieve the time-of-flight measurements with an accuracy of about 0.5 ns. This technique was used for measuring of plane residual stress in welds and for in-depth testing of subsurface residual stresses in metals. Plane stress distribution for welded metallic plates of different thicknesses (2–8 mm) and the subsurface stress distribution for titanium and nickel alloys were obtained. The results of conventional testing are in good agreement with the laser ultrasonic method. An important aspect of the integrity of oil and gas pipelines is the heat-affected zone (HAZ) of girth welds where the microstructure of the as-hot rolled steel is altered with potentially adverse effects on the HAZ properties. Therefore, it is critical to evaluate the HAZ microstructure for different welding scenarios. Here, an integrated microstructure evolution model is proposed and applied to the HAZ of an X80 linepipe steel. The model considers dissolution of Nb-rich precipitates, austenite grain growth and austenite decomposition into ferrite and bainite. Microstructure maps showing the fraction of transformation products as a function of distance from the fusion line are obtained and used to compare the effect of different welding procedures on the HAZ microstructure.